This painting changed course a number of times before the final was decided. I was intending to have a painting with a blue grey look of early dawn with a lot of emphasis on the sky. I spent a lot of time getting the sky right and when the plan changed it was almost completely covered by trees, which meant scraping off the sky paint to make the application of the darker colours easier. The theme of the blue grey morning will have to wait for an other time. The overall plan of light creeping into the dark places where night hides has been achieved, just in a different way. The introduction of green (Chrome Green Light) at the later stages of the painting was a bit tricky as it wasn’t in the plan from the start. 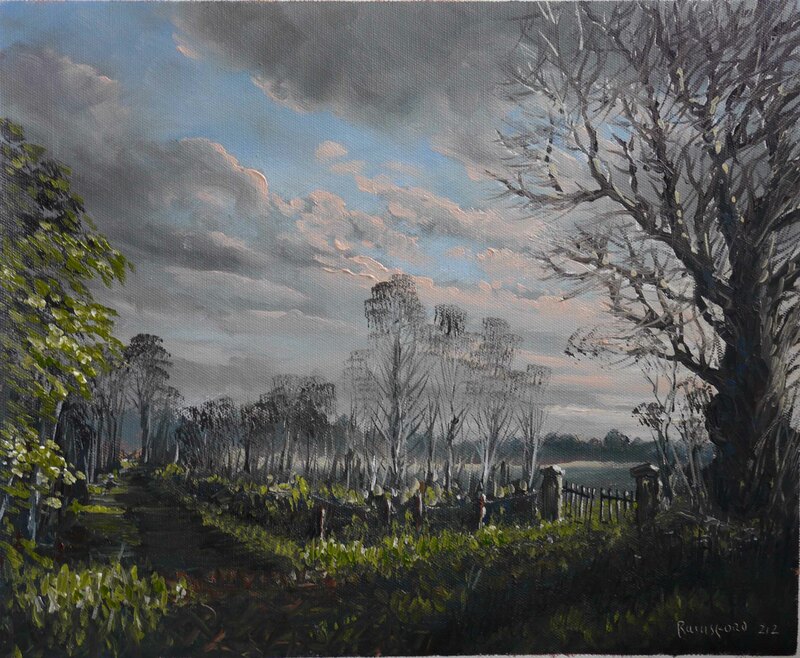 Usually if I was going to use a colour as strong as this green I would make sure it was used elsewhere in the painting especially in the sky mixes to produce a natural harmony of colour. It worked out OK in the end as most of the sky was covered with trees and these had green in their mixes. The colours used were: Burnt Sienna & Raw Umber (red), Raw Sienna (yellow) and French Ultramarine (blue). Also Chrome Green Light, black and white. I am preparing 2 videos at the moment, one for the previous painting and also this painting. Hopefully they will be available for you before the week is out. I was in the woods again on Saturday. In a week the buds have begun to arrive on the trees so I am in the ‘in between’ period of ‘not quite so bare’ trees. No leaves yet (on deciduous trees), but not bare twigs as in the previous painting of this area. I used the point of the painting knife to scratch suggested details into the bare branches. To keep a uniformity of texture over the entire painting surface, I placed ‘blobs’ of colour and broke it up with the knife. This produces a different ‘randomness’ of shapes to the type seen in this painting of a woodland. It has an almost ‘photographic’ look when compared to the woodland painting. Its also time consuming. I used this technique to suggest the ‘almost invisible’ wire in the Hen Run painting. In the above scene the individual buds could not be seen, but the branches had a ‘fatter’ look, unlike the sharp twigs of the frozen winter landscape. I will return here in a month or so and see do the leaves add anything interesting to the scene from a painting point of view. The colours used were: Burnt Sienna & Raw Umber (red), Yellow Ochre (yellow) and Cobalt Blue. Sap Green, black and white were also used. Sap Green is easier to control than Viridian. Its not as strong a colour and has a more natural look. It mixes well with Yellow Ochre and when white is added does not loose much ‘chroma’. Unfortunately, its a distinctive colour and if used in all paintings requiring ‘spring green’, will tend to get boring. Other greens I find useful are the Chrome Greens, Light and Dark but they tend to ‘die’ a little when white is added to mixes. I will work on the video of the painting process in the next few days. Even in ‘speeded up’ mode you will see how the knife is used to texture the undergrowth and bare branches of the trees. See you then. I was a dull, damp day when I took this photo, this time last year. I didn’t have a subject in my head to paint so I had a look in my photo collection for something to do. Although the photo looks OK as a photo, the ruins would have dominated the scene in a painting. If it was possible to move much further back and use a telephoto lens, the ruins would have appeared smaller, relative to the background. In reality this was not possible so in the composition of the painting I did this and also elevated the viewpoint to include more detail in the middle distance and see more of the lake. 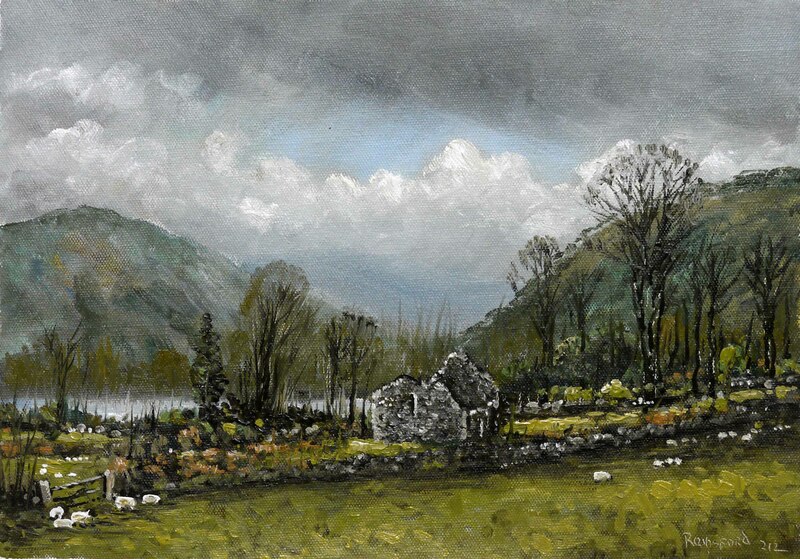 Glendalough is in County Wicklow, a few miles east of where I live. It was the site of a monastic settlement founded in the 6th century. Its a magical place with ruins everywhere. 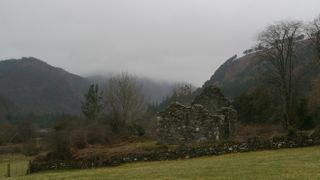 Saint Laurence O’Toole, born a mile from where I live, in 1128 ad, was Abbot of Glendalough until 1162 ad. Coincidently, he died in Eu in Normandy in 1180 ad, as the Normans (recent invaders) were building Kilkea Castle (mentioned in previous post), almost on top of his ancestral birthplace in the fortress of Mullacreelan. The colours used were: Burnt Sienna & Raw Umber (red), Yellow Ochre (yellow) and Cobalt Blue (blue). I also used Viridian Green, black and white. I needed the ‘tube’ green to get the colour of the spring grass in the foreground. I never liked Viridian. Its a very strong ‘unnatural’ colour. The grass colour was got by adding the green, a little at a time, to Yellow Ochre. The under colour of Burnt Sienna mixed a little with this green to neutralise it and make it more natural. I will have the video of the painting process for the next post. See you then. There is a lot of ‘scratching’ going on in this painting. Alla prima is to blame. It is practicably impossible to paint a fine line on top of a wet layer of paint. 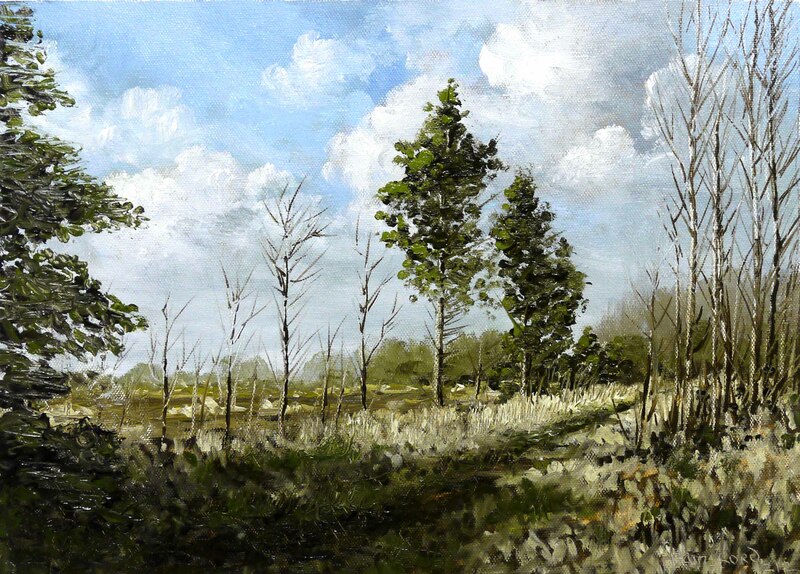 Short strokes are OK, but long unbroken lines, as in the Ash trees on the right in this painting, are a problem. In a previous post (here), I was talking about brushes. Small brushes can force a painter into tedious details too early in the process at the expense of the overall picture. Using a knife will produce details quickly so the painter does not become bogged down. These ‘scratch’ lines also remove the under layer of wet paint into which the fine lines can be painted. In this painting, I also scratched off larger parts of the under-painting which allowed me to apply the dark colour of the evergreen trees without interference from the light coloured sky paint. At the other end of the scale is the very large brush, as in house painter’s 2 or 3 inch brush. I don’t like the practise of using these types of brushes to ‘stamp’ a shape into the painting which can produce a monotony of ‘clichés’ which are the mark of the brush and not the ‘mark of the hand’ of the artist. 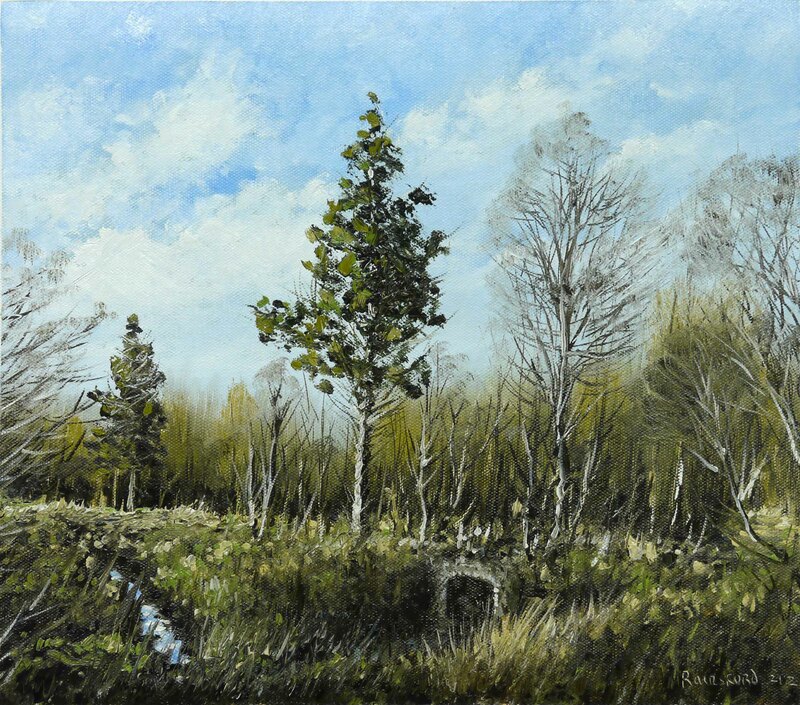 In painting the foliage of the evergreen trees I used a round brush (No. 4 or about 5mm diameter). Even with most of the wet under-painting removed the brush will still pick up some unwanted colour from the surface. If the brush is rotated as the paint is applied, several ‘dabs’ of clean colour can be applied before the brush needs to be wiped to pick up fresh paint. I’m not advocating painting every single leaf, but clumps of leaves to create a ‘profile’ of the particular tree type. Here is the video of the painting process. There is more info. on this painting in the previous post. The video is 720 HD and can be watched at a large size by changing the Quality settings on the YouTube bottom panel (see here). I was in the woods again on Saturday. It was bitterly cold despite the sunshine. I had my camera with me this time and took a few photos. This scene I photographed and I have included the photo here to show the translation from photo to painting. 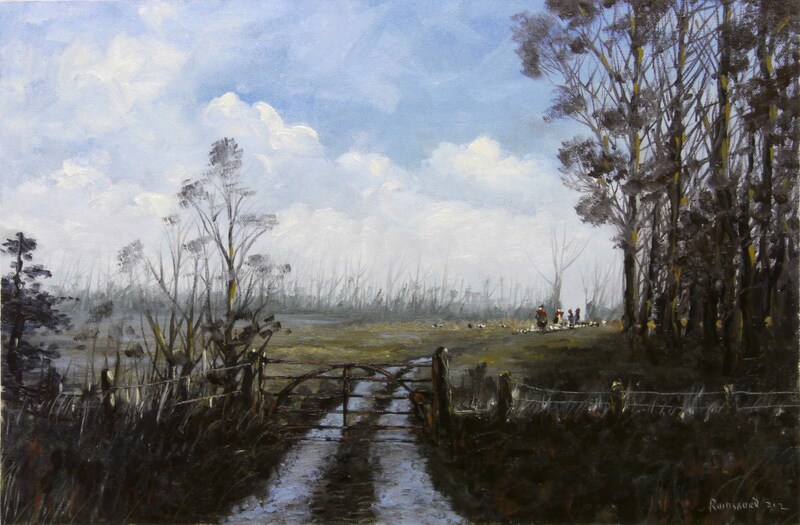 The 2 evergreen trees were the centre of my interest, but the trackway disappearing into the distance and providing an exit from the scene was where I placed the centre of interest in the painting. The sky was a boring gradient of blue. I created a ‘Constable’ sky. Not so much the Constable of the ‘finished’ paintings like The Hay Wain, but the oil sketches he completed before he started to paint the official version for the Royal Academy. These sketches were painted quickly and are very like the later Impressionist paintings. The painting is a compression of the scene, the distance and the foreground are brought closer together. The large shadow in the foreground had to be ‘explained’ in the painting by creating the edge of a tree which would have created this shadow. To help create a ‘raw’ feeling to the scene I used a knife to scratch sharp suggested details especially in the leafless Ash trees. This scratching effect then had to be carried to other areas of the painting for uniformity of texture (click on the painting to see the ‘scratch’ marks of the knife). To help carry the eye into the distance and follow the track, I changed the shape of the evergreen trees. Their right hand side form a line which points towards the end point of the trackway. 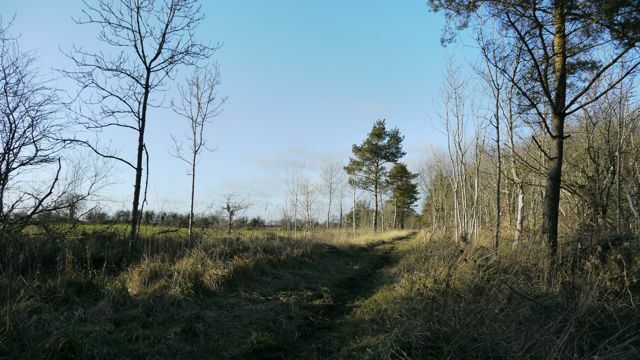 Also, the trees on the extreme left, point towards this end point, connecting foreground and distance. The colours used are: Burnt Umber & Burnt Sienna (red), Yellow Ochre (yellow) and Cobalt Blue. Also used are Sap Green, black and white. Sap Green has a distinctive colour, so in the interests of colour harmony I included it in the sky colours. The Cobalt Blue and white mix, for the blue of the sky, has a definite ‘Sap Green’ tinge about it. I find greens from the ‘tube’ to be a bit unnatural. Small amounts of red added to these greens helps a little. I made the red end of the mixes a little stronger by the inclusion of Burnt Umber instead of my usual Raw Umber. The painting took about an hour and a half to complete. I will have a video of the process for the next post. See you then. As any blogger who tries to upload photos or home made videos knows, what you finally see on your blog page never quite looks like what you intended. I constantly have trouble trying to get exposure and colour balance right on the photos and the video. I use the same lights, camera and computer software and still the difference between still photos and video can be enormous. The exposure is simple, or should be. If the viewfinder is filled with an image of the blank white canvas, automatic exposure will underexpose the image. This is because the camera is programmed to find the average light reading and record it as an average. But the white is not the average. To find correct exposure I take a manual reading from a mid grey card, this is an average. When the white canvas is then placed in front of the camera, with this setting, it will show an overexposed image, that is, a pure white canvas. By the time the painting is finished, if there are equal amounts of darks and lights in the painting, the exposure is indicating correct exposure. If it’s a dark painting it will appear to be underexposed and if a bright painting it appears to be overexposed. This is OK, as dark paintings are supposed to be dark and light coloured paintings light. When viewed on a computer screen, in Photoshop or web browsers, the brightness of the screen or the room lighting where the screen is viewed will affect the apparent brightness of the picture. Alexander made a comment, on the ‘Dollardstown Wood’ post, about the darkness of the photo. He was right. I had edited the photo in Photoshop in a darkish room. It looked OK to me at the time but when I read Alexander’s comment, I had a look at the post and the photo was, indeed, too dark. He adjusted the exposure and included a link to the photo (here). This brings me to the other problem with photos – colour balance. Although the exposure was correct the colour balance was too red. I use iMovie to edit the video because its fast and simple to use. I set the colour balance using the white blank canvas. But still the video always looks a little too red. The still photo (at the start and end of the video), has the same colour balance and is close to the actual colour of the painting. But when placed into the video the colour is altered towards green. There are video editing facilities in iMovie but these are too crude to make the fine adjustments needed. To add further to the mess, YouTube compresses and causes further colour changes which are totally beyond my control. I archive the original video until the technology improves to allow a more accurate representation of the painting. Some day in the near future, hopefully, I will be able to make available the full 1 to 2 hour video. For a beginner in painting this might be useful. Here’s the video. There is more info on this painting in the previous post.